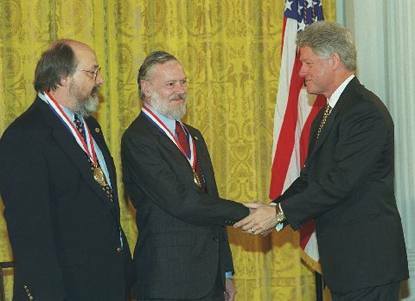 WASHINGTON, D.C. (April 27, 1999) -- Dennis Ritchie and Ken Thompson of Bell Labs received the U.S. National Medal of Technology today from President Bill Clinton at ceremonies televised at the White House. Ken Thompson (left) and Dennis Ritchie receive the National Medal of Technology from President Clinton. During his introductory remarks, President Clinton said, "I'd like to take just a moment to reaffirm something that is obvious to all of you, but needs to be equally clear to your fellow Americans. In an age when the entire store of knowledge doubles every five years, where prosperity depends upon command of that ever-growing store, the United States is the strongest it has ever been, thanks in large measure to the remarkable pace and scope of American science and technology in the last 50 years." Ritchie and Thompson are the sixth and seventh individuals to receive the National Medal of Technology in recognition of work done at Bell Labs. The first National Medal of Technology awarded to an institution was given to Bell Labs. "The quality of life and economic strength that all Americans enjoy is due to the vision and dedication of innovators like those we honor here today with the National Medal of Technology," Commerce Secretary William M. Daley said yesterday. "These Medalists have earned our highest honor for their work in creating life-saving practices and products, plants that increase crop yields, and the basis for modern computer operating systems and software." The award, administered by the Commerce Department's Office of Technology Policy, is the country's highest for achievement in technology. It honors breakthrough concepts and inventions. Thompson and Ritchie were cited for their invention of the UNIX* operating system and the C programming language. Both men also helped develop the Plan 9 and Inferno(TM) operating systems, invented at Bell Labs and introduced in 1995 and 1996, respectively. Most recently, they have contributed to the development of Lucent's PathStar(TM) Access Server, which provides packet voice and data services. The Medal citation describes their inventions as having "led to enormous advances in computer hardware, software, and networking systems and stimulated growth of an entire industry, thereby enhancing American leadership in the Information Age." "With UNIX and C, Ken and Dennis changed the way people used, thought and learned about computers and computer science," said Arun Netravali, executive vice president of research at Lucent's Bell Labs. "Few people have had such impact on their colleagues, on generations of students and on an entire industry." In a prepared statement at the time of the announcement last year, Thompson and Ritchie said, "We are greatly honored by this recognition of work that has continued over many years. Although the world of computer and communications hardware and software seems to change dramatically even month-to-month, there are also long-lasting themes and approaches that continue to influence the industry over the long term. "We take this award to us as symbolic of the seminal contributions of our immediate colleagues at Bell Labs during the early days of the development of the UNIX system and the C language; many of the most interesting ideas were not ours, but generated in collaboration. Similarly, the acceptance of the software in the commercial world, academia, and government owes jointly to the support and work by Bell Labs development organizations, the University of California at Berkeley, and DARPA. In more recent years, the growth of the workstation industry, and most recently the open-software movement, have drawn on these developments from the 1970s. "The success and survival of UNIX and its related ideas over nearly 30 turbulent years owe in great part to a symbiosis among the commercial, academic and government communities. Another key ingredient, though, has been the commitment of Bell Labs--under the old Bell System, then with AT&T, and now in Lucent Technologies-- to support of broadly-based research. Industrial research, like all other kinds today, struggles to explore the right paths leading both to 'Internet-time' performance and longer-term, more fundamental discoveries. "Bell Labs has, over many years, supported a broad program of research that includes not only computer software and hardware, but mathematics, many areas of solid-state physics and materials science, radio technology, and even cosmology and the distribution of matter in the Universe. This diverse excellence is the source of much of the intellectual nourishment of Bell Labs researchers. Happily, this support has led to products and tools useful to our company, to the computer and communications industry generally, and to society." Much of the progress of computer hardware, software, and networks during the past quarter century can be traced to Ritchie and Thompson's creation of UNIX and C language. Without operating systems, computer hardware is useless; before UNIX, operating systems were large, vendor-specific, and designed to cope with particular features of a given machine. UNIX was the first commercially important portable operating system, usable almost without change across the span of hardware from the smallest laptops to supercomputers. It embodies visionary ideas -- deliberate generality and openness -- that continue to be a strong force today. Many of its approaches and notations influence the entire span of operating systems. The successes of UNIX are intertwined with C, the first general-purpose programming language to combine the efficiency of assembly language with high-level abstract expressiveness. Like UNIX, C programs can move essentially without change from machine to machine, eliminating the need for expensive, error-prone software rewrites. UNIX is the operating system of most large Internet servers, businesses and universities, and a major part of academic and industrial research in operating systems is based on UNIX. Most commercial software is written in C or C++, a direct descendant of C that was also developed at Bell Labs, or more recently Java, a C++ descendant developed at Sun Microsystems. Ritchie and Thompson joined Bell Labs within a year of each other, Thompson in 1966 and Ritchie in 1967. They worked closely together for several years on the design and development of UNIX. The C Language, in which the UNIX operating system is written, was invented by Ritchie. It grew out of an earlier language, B, written by Thompson. Ritchie and Thompson had also worked on the Multics operating system project, a collaboration of MIT, Bell Labs and GE, which pioneered many of the ideas incorporated in UNIX. UNIX ultimately eclipsed Multics, in part because of its portability and adaptability to readily available computers. Both Ritchie and Thompson are Bell Labs Fellows, an honor bestowed for sustained and exceptional contributions to research. Each has received numerous external awards, and they have jointly received the ACM Turing Award, the IEEE Emmanuel Piore Award and the Richard W. Hamming Medal. Thompson is a Distinguished Member of Technical Staff in the Systems Software Research Department. His research topics have included operating systems, programming languages, and computer games. With J.H. Condon, he developed a chess-playing computer, "Belle," that won the U.S. and World Computing Chess Championships in 1980. He was a visiting professor at the University of California, Berkeley, in 1975-76, and at the University of Sydney in Australia in 1988. Thompson earned B.S and M.S. degrees in electrical engineering from the University of California at Berkeley. He is a member of the National Academy of Sciences and the National Academy of Engineering. Ritchie heads the Systems Software Research Department. He has worked on the design of computer languages and operating systems. He holds a B.S. in physics from Harvard University, where he also earned an M.S. and completed a Ph.D. thesis in applied mathematics. He is a member of the National Academy of Engineering. Five other scientists have received the National Medal of Technology for work done at Bell Labs: John Mayo in 1990, W. Lincoln Hawkins in 1992, Amos Joel in 1993, and Richard Frenkiel and Joel Engel in 1994. Bell Labs, itself, was the first institution to receive the National Medal of Technology, in 1985. Eleven scientists have received the Nobel Prize in Physics for work done at Bell Labs, including most recently Horst Stormer, Daniel Tsui and Robert Laughlin, winners of the 1998 prize. Two Bell Labs scientists, Federico Capasso and Rudolph Kazarinov, this month received the 1998 Rank Prize, the world's most prestigious award in optoelectronics. For more on the National Medal of Technology, see U.S. Department of Commerce - President Awards 1998 National Medals of Technology. To read the President's remarks on presenting the National Medals of Science and Technology, see Remarks by the President During the National Medal of Science and Technology Awards Ceremony. This information is based on a press release written by Donna Cunningham and Patrick Regan of Bell Labs Media Relations.